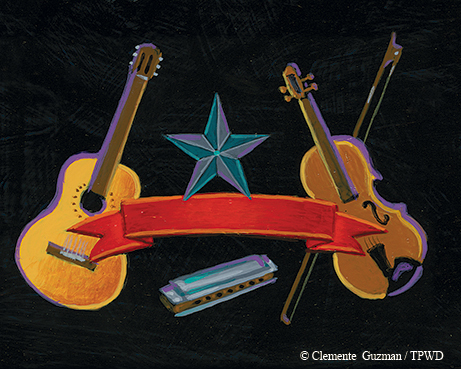 Musical stories flow through Texas waterways. If you hurl a stick off the edge of the Panhandle’s Caprock into the first stirrings of the Brazos River below, you can watch the river, as portrayed in song, carry it past heartbroken lovers, cattle-driving cowboys, early Texas settlers and cane-cutting prisoners before washing into the Gulf of Mexico. In many ways, rivers define Texas. They form our borders, and our cities were founded on them. Our songs celebrate them. Songs about Texas rivers have flowed melodically across the state for generations, from the Red River to the Rio Grande. In fact, the first known English-language song written in Texas was a river song. What do crooning cowboy Gene Autry and ’80s pop band Duran Duran have in common? They’ve both sung songs about Texas rivers. For ages, rivers have inspired people with their mystery, beauty and strength. That’s reflected in American songs such as the traditional Shenandoah, the political Roll On, Columbia and the spiritual Down by the Riverside. In Texas, the allure of rivers is given voice in songs such as Guy Clark’s ancestral Red River, Jimmie Dale Gilmore’s lyrical Another Colorado, Mance Lipscomb’s bluesy Which-a-Way Do Red River Run and Billy Walker’s country classic Cross the Brazos at Waco. At their foundation, river songs tell our stories in ways that viscerally link us to the natural streams that flow through our state. 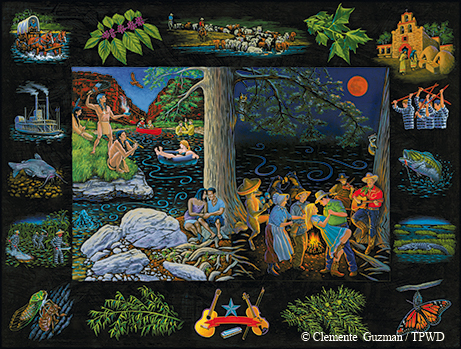 The dual nature of our relationship to rivers appears in stark contrast in Roger Creager’s River Song, in which Creager celebrates good times with his buddies on the Comal River, and the folk song La Llorona, in which a mother haunts the Rio Grande after throwing her children into the river to gain the affections of a man. River songs tie together the human world and the natural world in musical ways. Rivers are witness to the full human experience; activities seem to take on a deeper meaning when they take place next to a flowing stream. River songs often deal with intimate personal concerns, most commonly the blossoming of love or the ending of a relationship. Just as most pop songs are about love, it’s no different with river songs. Corey Morrow happily dances with his gal by the river in the contemporary Dance by the Rio Grande, while Michael Fracasso cites the Brazos River’s “restless waters stirring trouble down deep” before his lover disappears in the river in Brazos River Blues. The Guadalupe River proves to be particularly amorous. Butch Hancock, Pauline Reese and Jackson Eli all spend time with their lovers along the river’s banks in three different songs that share the same title: Banks of the Guadalupe. Rivers also serve as a nostalgic reminder of home and childhood. They retain an eternal quality even when everything else has changed. In There’s a Rainbow on the Rio Colorado, Autry croons that the rainbow on the river “calls me to my western Texas home.” Rattlesnake Annie, who must leave her Brazos River home, laments “goodbye to a river, goodbye to the trees, goodbye to the night birds that sing in the breeze” in Goodbye to a River. What makes a river song? The song can’t just mention a river or just have a river in the title. To be a true river song, it has to do one of two things. It has to engage a river as a physical entity — going down to the river, getting into the water or being directly affected somehow by the river (T-Bone Walker curses “that dirty Trinity River” coming in his windows and doors in Trinity River Blues). Or it has to embrace a river as a metaphor — cleansing your sins, serving as a barrier or boundary or carrying away your sorrows (Hays Carll washes his sins in the Angelina River in Rivertown). Three Texas rivers seem to appeal to songwriters the most — the Brazos, the Red and the Rio Grande. And three songs have particular prominence in the canon of Texas river songs — Mary Austin Holley’s Brazos Boat Song, the prison work song Ain’t No More Cane on the Brazos and the cowboy folk song Texas River Song. Each represents a unique and important chapter of Texas history. River songs have been a part of Texas history going back to before Texas was a republic. Mary Austin Holley, a cousin of Texas colonizer Stephen F. Austin, visited Texas in 1831 and composed what is acknowledged to be the first English-language song written in Texas, the Brazos Boat Song, inspired by her trip up the Brazos River to Austin’s colony. The song was resurrected a century later, in 1934, when playwright John William Rogers wanted to include it in his play Westward People, based on Holley’s letters. He was unable to find a copy and wrote his own Brazos Boat Song. In 1936, musician David Guion adapted Rogers’ song for use in the Texas Centennial celebration, propelling the song into national prominence, even though the 20th century version bears little resemblance to Holley’s original. West of Houston, where the Brazos River cuts deep into the rich Texas plain, the fertile land is ripe for producing crops like cotton. And if you’ve heard of a town called Sugar Land, you might know that the plantations there also grew sugar cane. Noted folklorists John and Alan Lomax made a field recording of the song in the 1930s, and singers in the 1960s folk movement who were looking for authentic folk music picked it up. “If you want a song about the gritty realities of prison life, this is it,” Wheat says. Ain’t No More Cane has been recorded by groups such as The Band (on the landmark Basement Tapes), Odetta and Son Volt. Lyle Lovett does a stirring version of Ain’t No More Cane in live performances with his Large Band. In the movie Festival Express, Janis Joplin joins Rick Danko of The Band in an ad hoc rendition of the song as they travel by train across Canada. Bruce Jackson, a folklorist, writer and professor at the University of Buffalo in New York, says these types of prison songs were called work songs in other states, but in Texas, prisoners called them “river songs” because most of the prison farms were on the Brazos and Trinity rivers. The work song tradition originated in West Africa and was carried over by slaves to America. The tradition continued at Texas prison farms. 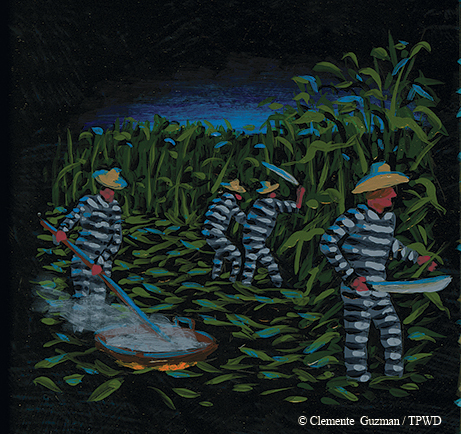 Prisoners used machetes to chop down row after row of sugar cane, their big blades moving in ringing rhythm to the song. The songs allowed workers to pass the time, coordinate body movements and give poetic voice to things of interest — a brutal combination of art and survival. The mournful moaning voiced after each line adds to the mystical, musical beauty of the song. “Ain't no more cane on the Brazos. Ohh-ohh-ohh. It’s all been ground down to molasses. Ohh-ohh-ohh. 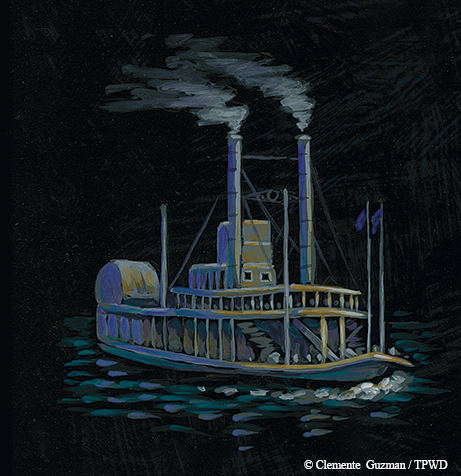 You shoulda been on the river in 1910. Ohh-ohh-ohh. Any discussion of Texas river songs has to include the Texas River Song, a folk song that manages to name 14 Texas rivers. Singer Townes Van Zandt recorded the song, as did Lovett on his album Step Inside This House. Wheat says it’s a well-known song that people started singing in the 1800s. The wording can change depending on who sings it. “We crossed the wild Pecos, we forded the Nueces. We swum the Guadalupe and we followed the Brazos. Red River runs rusty, the Wichita clear. As Ain’t No More Cane on the Brazos, Texas River Song, Brazos Boat Song and countless others show, there’s something about a river that lends itself to song. In Texas, the rivers flow out of the hills and across the plains and into the bays. The songs flow with them. Along the way the songs carve the canyons, flow over the rocks and flood the fertile river bottoms of our imaginations, carrying our stories, our history and our secrets, lifting up our joys and drowning our sorrows. Listen to our Spotify playlist of dozens of Texas river songs. Visit http://spoti.fi/1Xz1RIR.